We’d love your help. Let us know what’s wrong with this preview of The Signature of Jesus by Brennan Manning. The Signature of Jesus challenges the gospel of "cheap grace" and calls the church to radical discipleship. With passion and boldness, author Brennan Manning invites readers to risk living life as Jesus lived—committed to simplicity, purity of heart, and obedience to the gospel. As a radical alternative this book is offered to Christians who want to live by faith and not by mere “religion,” for those who recognize that many of the burning theological issues in the church today are neither burning nor theological; who see Christianity neither as a moral code or a belief system but as a love affair; who have not forgotten that they are followers of a crucified Christ; who know that following him means living dangerously; who want to live the gospel without compromise; who have no greater desire than to have his signature written on the pages of their lives. To ask other readers questions about The Signature of Jesus, please sign up. Re-read this book, which first came out in 1988, and I cannot believe how appropriate it is for today. The chapter on “the discipline of the secret” now seems totally prophetic. The chapter on discipleship is challenging and the chapter on “grabbing aholt of God” makes me want to become a hermit for a day or two. So much gold in here, written by a man who was just so kind, so it doesn’t come across as preachy, ever. Manning has a unique ability to give a good kick in the pants whilst preventing you from condemning yourself. He paints a picture of radical discipleship and always leads the reader to Jesus, the Spirit and our Abba Father. A book to be savoured rather than gulped. I hope to re-read it in the years to come (not something I say very often). Manning is one of my favorite nonfiction writers. He speaks so profoundly about love, goodness, and grace; the source of all being Jesus Christ. Discipleship is difficult at times, if we truly follow Jesus. However, He invites all of us, ragtag misfits, to join in the good life. Profound, simple. It's all about love- get religiosity out of here. Even though this book was written years ago, it is so timely. It’s message coincides with everything I’m hearing and sensing that the Lord is saying to His Church. The last paragraph of the book sums it up so well. If you’re searching for meaning in your life, read this book! Una vez más Brennan Manning nos presenta la fe apuntando al amor extraordinario de Dios y las demandas del Evangelio teniendo muy presente la realidad de nuestra naturaleza. Un libro que nos llena de esperanza y nos desafía a caminar con Dios sin esconder nuestras debilidades. The greatest need for our time is for the church to become what it has seldom been: the body of Christ with its face to the world, loving others regardless of religion or culture, pouring out in a life of service. offering hope to a frightened world, and presenting itself as a real alternative to the existing environment. God utters m The greatest need for our time is for the church to become what it has seldom been: the body of Christ with its face to the world, loving others regardless of religion or culture, pouring out in a life of service. offering hope to a frightened world, and presenting itself as a real alternative to the existing environment. Great read! Wonderful insights on prayer and moving from a life of beliefs to a life abundant in faith. I liked it better than Abba's Child. Thought-provoking, challenging, and honest are some words that can be used to describe The Signature of Jesus by Brennan Manning. In it, the reader is forced to strip away religion and encouraged to pursue the love of Jesus. Through beautiful writing, Manning shares with us his life with the Risen Christ and how He has redeemed his life from self-justification. At the same time, Manning in every chapter teaches us how to have the mind of Christ, how to be a radical disciple of Christ, and how to Thought-provoking, challenging, and honest are some words that can be used to describe The Signature of Jesus by Brennan Manning. In it, the reader is forced to strip away religion and encouraged to pursue the love of Jesus. Through beautiful writing, Manning shares with us his life with the Risen Christ and how He has redeemed his life from self-justification. At the same time, Manning in every chapter teaches us how to have the mind of Christ, how to be a radical disciple of Christ, and how to have a koinonea fellowship with Him. The book centers its message and theme on the idea of radical and true discipleship for Christ, where our beliefs are transformed into faith by having “a spirit of sheer receptivity, utter dependence, and radical reliance on the power and mercy and grace of God mediated through the Spirit of the Christ” (p.15). This book calls us to be different, humble, courageous, and real. Manning takes us to a journey from a land of beliefs, religion, and rituals, to a land of faith, love and intimacy with God. This was a very thought-provoking book on not so much Christian living as Christian being. The big question is, "is my life marked with the signature of Jesus?". It's not about living in such as way as to try to gain the "approval" of Jesus, but living in such as way as we would if we really understood that we already DO have His approval. So many churches and Christian leaders and pastors try to teach us to be better Christians; be more like Christ. And so often, that is supposed to be done by This was a very thought-provoking book on not so much Christian living as Christian being. The big question is, "is my life marked with the signature of Jesus?". It's not about living in such as way as to try to gain the "approval" of Jesus, but living in such as way as we would if we really understood that we already DO have His approval. So many churches and Christian leaders and pastors try to teach us to be better Christians; be more like Christ. And so often, that is supposed to be done by "doing" or "not doing" certain things. 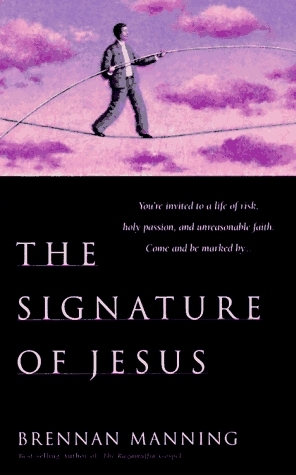 In The Signature of Jesus, Brennan Manning conveys, based on his and others' life experiences, personal prayers and meditations, quotes, stories, studies, and even his own failures that if we truly understand the profound, sacrifical and unconditional love that Jesus has for us, that our life cannot help but be a reflection of that love. This idea really brings to light the verse that says, "and the truth shall set you free", because it does offer a release from the church and self-imposed striving that we often do to gain something that, in the end, we already have, when we believe in faith that Jesus is who He says He is. I really enjoyed much of this book. Manning is widely known as the "grace guy." I started reading, intrigued by the implication of Manning's claim that "radical grace requires a response of radical discipleship." There were several chapters and sections that I just couldn't zip through. They were so good and thoughtful that I had to pause and sit with the contents for a bit. However, I struggled throughout the book to see where it was heading. There wasn't a coherent narrative or movement (not tha I really enjoyed much of this book. Manning is widely known as the "grace guy." I started reading, intrigued by the implication of Manning's claim that "radical grace requires a response of radical discipleship." However, I struggled throughout the book to see where it was heading. There wasn't a coherent narrative or movement (not that I could discern). Some chapters felt completely disconnected from the previous or the following chapter. The content wasn't bad. It was just difficult to integrate into the single theme of "radical discipleship," at least in a connected way. I didn't have high expectations when I began this book. However, it didn't take long for me to gain a huge respect for the author and the book itself. The Signature of Jesus addresses many parts of the Christian life, and challenges readers to want and pursue more out of their relationship with Christ. Brennan Manning offers insights on prayer, discipleship, service, the darkness of the Christian walk, and many more aspects of our walk with Christ that we will all have to face. It is highly conv I didn't have high expectations when I began this book. However, it didn't take long for me to gain a huge respect for the author and the book itself. The Signature of Jesus addresses many parts of the Christian life, and challenges readers to want and pursue more out of their relationship with Christ. Brennan Manning offers insights on prayer, discipleship, service, the darkness of the Christian walk, and many more aspects of our walk with Christ that we will all have to face. It is highly convicting, while still being encouraging and emphasizing the immense love and grace of Jesus. I read this book after reading a Dallas Willard book and so this book doesn't seem as rich and full as I normally find Manning. But, Manning always makes me cry, and this book made me stop and pause a few times, and think about the implications of what he was saying. As always, Manning's books make me uncomfortable. He is so emotional and raw, and he challenges me to rethink many of my assumptions. I have highlighted many other books from his reference list and will continue to use the "personal I read this book after reading a Dallas Willard book and so this book doesn't seem as rich and full as I normally find Manning. But, Manning always makes me cry, and this book made me stop and pause a few times, and think about the implications of what he was saying. As always, Manning's books make me uncomfortable. He is so emotional and raw, and he challenges me to rethink many of my assumptions. I have highlighted many other books from his reference list and will continue to use the "personal retreat guide" over the next few days. A book that touched my life on contemplative prayer. I have been blessed by following the silent prayer and the prayer where I would listen to Christ's voice. Towards the end of his book, Manning brought me to believe that the many experiences of people I had thrashed in the past as mere imaginations and dreams, to be real when the relationship with Christ deepens! I really loved this book. I'd recommend this to all of those who are beginning to follow Christ, and to those who want to be radical A book that touched my life on contemplative prayer. I have been blessed by following the silent prayer and the prayer where I would listen to Christ's voice. Towards the end of his book, Manning brought me to believe that the many experiences of people I had thrashed in the past as mere imaginations and dreams, to be real when the relationship with Christ deepens! I really loved this book. I have read this book over and over and over again. Every time there is something else that is life changing. Brennan's, what can only be described as emerging, views on the church are not only poignant but filled with the grace and love of Christ. He is an author that cuts straight to the nitty gritty, leaving all traces of jargon and over spirituality on the wayside. I would hit the five stars a million times for this book. I read this when I was 15 or 16. It was my first encounter with Brennan Manning- a man who I had heard many wonderful things about from people I admired. After finishing it, I remember thinking "THAT was "THE Brennan Manning?!". It wasn't bad, by any means...but I don't remember finding anything overly profound, or anything that would make him worthy of the hype surrounding his stuff. Decent book, but a bit underwhelming after hearing how incredible his stuff is. Richard Francis Xavier Manning, known as Brennan Manning (April 27, 1934 – April 12, 2013) was an American author, friar, priest, contemplative and speaker.Born and raised in Depression-era New York City, Manning finished high school, enlisted in the US Marine Corps, and fought in the Korean War. After returning to the United States, he enrolled at Saint Francis University in Loretto, Pennsylvania Richard Francis Xavier Manning, known as Brennan Manning (April 27, 1934 – April 12, 2013) was an American author, friar, priest, contemplative and speaker.Born and raised in Depression-era New York City, Manning finished high school, enlisted in the US Marine Corps, and fought in the Korean War. After returning to the United States, he enrolled at Saint Francis University in Loretto, Pennsylvania. Upon his graduation from the seminary in 1963, Manning was ordained a Franciscan priest.